An illuminated hand to render people motionless? 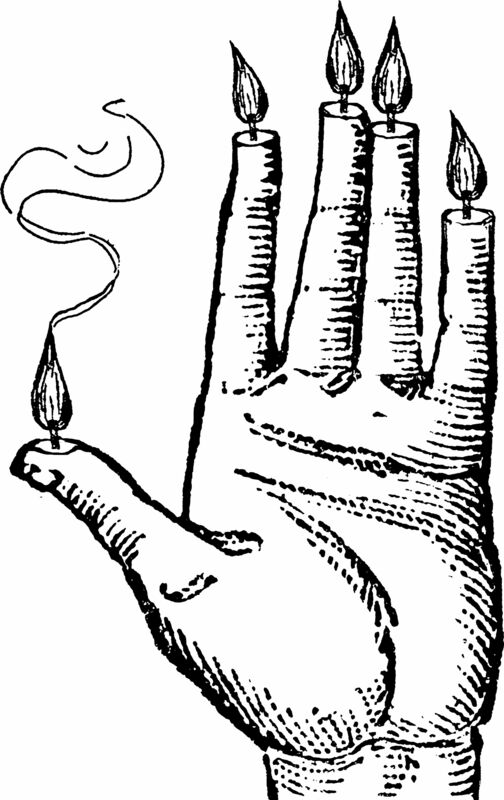 The “Hand of Glory” is the precursor to the “Don’t Walk” signal at traffic intersections. This occult horror of seventeenth century Europe required the dried and pickled hand of a hanged man, prepared with fat from the malefactor’s corpse. Such a baneful candelabrum, when lighted, rendered motionless any person who saw it. In some grotesque recipes, the hair of the dead man is used as a wick. hand of gloryCrucially, laying the Hand of Glory at a crossroads is part of its preparation. An illuminated hand at an intersection, stopping people dead in their tracks. No wonder this treatise on crossroads chiromancy is necessary. The old ways never actually faded—they merely hid behind new masks. The higher the technology, the deeper the necromancy.